In line with the WRU Inclusive Rugby Strategy the Dragons are continually looking at alternative rugby provision widen the rugby landscape and to engage with rugby enthusiasts from all walks of life. We are aiming to provide a diverse range of opportunities, so everyone can enjoy playing rugby through various forms of the game. A ‘Jersey’ for all approach. Through the vehicle of these provisions, we endeavour to positively impact on young people’s lives within our region. The benefits are improved physical well-being and mobility but also improving self-esteem and breaking down social barriers by encouraging participants to work as a team or in small groups and ultimately, making everyone feel valued. We use our regional identity as an important tool to promote participation and recruitment with the aim of providing a very positive experience and massive long-lasting impact on all our participants lives. WRU Hub Officers will target special schools and/or mainstream schools with SEN units to deliver 5-week rugby provision to inspire participants with a view of joining our ICC for further development and enjoyment of rugby. This provision is available for all schools once per year working with 8-14year olds. Last year we supported T21 - Dragons to promote World Down Syndrome Day by hosting a coffee morning at Rodney Parade and the Dragons squad wore odd socks to support the campaign. 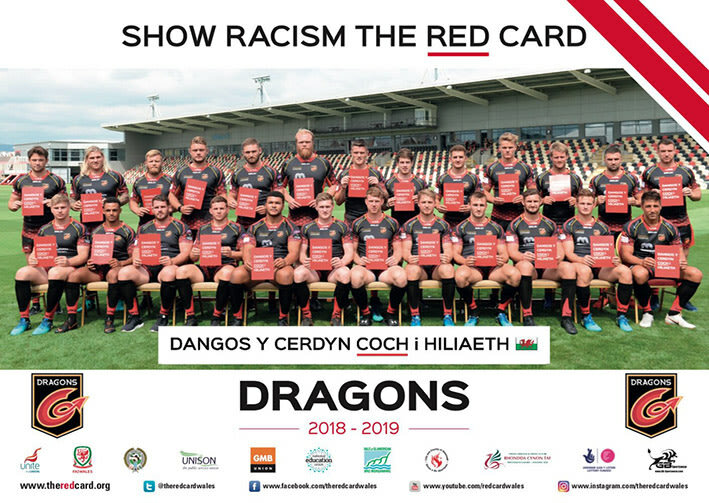 This season World Down Syndrome Day coincides with the annual Disability Six Nations event hosted at the Dragons training home at the CCB Centre For Sporting Excellence on 21st March 2019. We are delighted to support SRtRC who provide educational workshops for some of our regional schools. Through the workshop held at Rodney Parade, SRtRC use a whole host of inspiring resources with the aim of tackling racism in society. We have supported SRtRC for many years and continue to use the high-profile status of our players to publicise its very important message.